The Bow Valley Parkway is popular with cyclists. Whether you have your own bike or you rent one from the many bicycle shops in Banff or Lake Louise, cycling in Banff National Park is for everyone. The roads to Lake Minnewanka, Mount Norquay, through the golf course, and along the Bow Valley Parkway are all popular routes close to town. 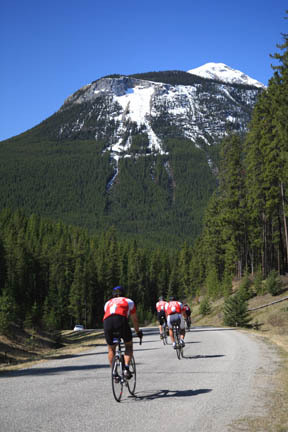 Several trails radiating from Banff and ending deep in the backcountry have been designated as bicycle trails. These include Sundance (3.7 km/2.3 miles one-way), Rundle Riverside to Canmore (15 km/9.3 miles one-way), and the Spray River Loop (via Goat Creek; 48 km/30 miles round-trip). Farther afield, other trails are at Redearth Creek, Lake Louise, and in the northeastern reaches of the park near Saskatchewan River Crossing. Before heading into the backcountry, pick up the free Mountain Biking and Cycling Guide from the Banff or Lake Louise Visitor Centres. Riders are particularly susceptible to sudden bear encounters. Be alert and make loud noises when passing through heavy vegetation. Bactrax (225 Bear St., 403/762-8177) and Banff Adventures Unlimited (211 Bear St., 403/762-4554) rent front- and full-suspension mountain bikes for $10 to 16 per hour and $40 to 70 per day. Rates include a helmet, lock, and biking map.